#1 Marketing Best Seller on Amazon.com! HOW TO TELL A DIFFERENT STORY, BREAK THROUGH THE CLUTTER, AND WIN MORE CUSTOMERS BY MARKETING LESS. No longer can we interrupt our customers with mediocre content (and sales messages) our customers don't care about. One of the world’s leading experts on content marketing, Joe Pulizzi, explains how to draw prospects and customers in by creating information and content they actually want to engage with. This groundbreaking guide gives you all the tools to start creating and disseminating content that leads directly to greater profits and growth. “As Joe shows us in his wonderful Epic Content Marketing, you must unlearn interrupting people with your nonsense. Instead, publish the valuable content they want to consume and are eager to share.” -DAVID MEERMAN SCOTT, bestselling author of The New Rules of Marketing and PR. Joe Pulizzi is one of the leading speakers in the world on content marketing delivering hundreds of keynote presentations to marketers, publishers and journalists around the world. He discusses how businesses and brands are achieving real marketing objectives by creating compelling, relevant and consistent content. Joe has spoken to audiences around the globe, including more than half the states in the US, Canada, Germany, Finland, Belgium, The Netherlands, Poland and more. Joe Pulizzi is the original content marketing evangelist, and started using the term “content marketing” back in 2001. He’s the founder of the Content Marketing Institute (CMI), the leading content marketing educational resource for enterprise brands, recognized as the 468th fastest growing private company by Inc. magazine in 2013. CMI produces the largest in-person content marketing event in the world, Content Marketing World, held every September in Cleveland, Ohio, which has been attended by half the Fortune 50. He has spoken at more than 200 locations and 10 countries around the world advancing the practice of content marketing. 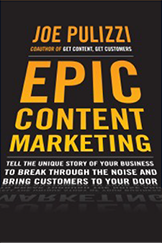 He’s also co-written two other books: "Get Content Get Customers" as well as "Managing Content Marketing." Find him online at JoePulizzi.com or on Twitter @JoePulizzi. If you ever meet him in person, he'll be wearing the color orange.